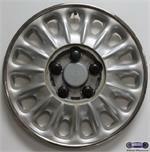 59363a, USED RIM, 16X6-1/2, 4 LUG, 100MM, 07-09, MINI COOPER, CLUBMAN, ALUM, 5 Y SPOKES, SPARKLE SILVER. Price: ORDER UNDER 59362a CENTER CAP. 74132b-1, CENTER CAP USED, 92-96, LEXUS, ES300, SPARKLE SILVER, PLASTIC CAP, 5 LUG NUT CUTOUTS, CHROME LOGO, METAL CLIPS, 4-3/8" DIA. 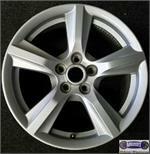 62479a, USED RIM, 16X7, 5 LUG, 4-1/2", 07-09, NISSAN, ALTIMA, 6 SPOKE, PAINTED BRIGHT SPARKLE SILVER, ALLOY. B=MED SILVER. 10027, USED RIM,'15-'16, FORD, MUSTANG, 17X7-1/2, 5 LUG, 4-1/2", ALUM, 5 SPOKE, SPARKLE SILVER, TPMS SHOULD BE REPLACED WITH LIKE WHEELS. 10027, USED RIM, '15-'16, FORD, MUSTANG, 17X7-1/2, 5 LUG, 4-1/2", ALUM, 5 SPOKE, SPARKLE SILVER, TPMS SHOULD BE REPLACED WITH LIKE WHEELS. 1144, HUBCAP USED, 15", 95-96, BUICK, REGAL, 10 SPOKE, SPARKLE SILVER, 5 SCREW ON LUG NUT CAPS, RAISED SILVER LOGO, 5 ANTI-RATTLE PINS, . 1146, HUBCAP CENTER USED, 96-98, BUICK, SKYLARK. SPARKLE SILVER WITH FULL COLOR LOGO, BOLT ON TYPE, FOR A 15", 8 RAISED SPOKES CAP. 2 PIECE, CENTER SOLD SEPARATE. 1148a, Hubcap CENTER USED, 97-03, BUICK, Century, SPARKLE SILVER, WITH RED WHITE & BLUE LOGO, 5 PLASTIC CLIPS & WIRE RING. 7" DIA. 1151, HUBCAP USED, 15", 00-05, BUICK, LESABRE. 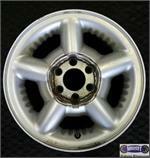 SPARKLE SILVER WITH CHROME RING ON OUTER EDGE, 15 HOLE 2 PIECE, 5 SCREW ON LUG NUT CAPS, CENTER SOLD SEPARATE. 1152, Hubcap used,16", 02-06, BUICK, RENDEZVOUS, SPARKLE SILVER, 8 SPOKE, RIDGES IN POCKETS, 5 PLASTIC SCREW ON LUG NUT CAPS, RAISED 3 FLAG LOGO, HELD ON WITH LUG NUTS NUT CAP. 1154, HUBCAP USED, 17", 05-06, BUICK, RENDEZVOUS, TERRAZA, SPARKLE SILVER, 8 SPOKE, 3 RAISES IN EACH POCKET, 5 DARK GRAY LUG NUT CAPS, HELD ON WITH LUG NUT CAPS. 1159, Hubcap used, 17", 10-11, BUICK, ALLURE, LACROSSE, 5 SPOKE TYPE, SPARKLE SILVER PLASTIC CAP, 5 LUG NUT CAPS, BLACK BACKGROUND CHROME LOGO, HELD ON BY LUG CAPS. 1467, CENTER CAP USED, 86-87, MERCURY, LYNX, SPARKLE SILVER PLASTIC CAP, ETCHED BLACK PAINTED X, 4 PLASTIC CLIPS, 3-1/8" DIA. 1677a, CENTER CAP USED, 89-92, FORD, THUNDERBIRD, SPARKLE SILVER PLASTIC CAP, ETCHED SILVER BIRD LOGO, PUSH IN, 6-7/8" DIA. 1677c, CENTER CAP USED, 89-92, FORD, THUNDERBIRD, SPARKLE SILVER T-BIRD LOGO, PUSH IN. 6-7/8" DIA. 1704, CENTER CAP USED, 90-97, LINCOLN, CONTINENTAL. SPARKLE SILVER WITH RAISED CHROME LOGO, PUSH ON TYPE, 7" DIA. 1716b, CENTER CAP USED, 90-92, EAGLE, TALON, MED GRAY, PLASTIC CAP WITH ENGRAVED EAGLE LOGO IN CENTER, 6" DIA..METAL CLIPS FOR A USED 16" RIM. 2002, CENTER CAP USED, 15", 91-93, DODGE, DAKOTA, SPARKLE SILVER, 6 FAKE LUG CAPS, RAISED RAMS HEAD LOGO, PLASTIC RING FOR SNAP ON COVER, 7-1/2 DIA. 2021, Used Rims, 15X6, 5 LUG, 4-1/2", 93-95, DODGE, PLYMOUTH, CARAVAN, VOYAGER, SPARKLE SILVER, ALLOY 5 SPOKE. 2032, CENTER CAP USED, 93-97, EAGLE, VISION, PLASTIC SPARKLE SILVER, ENGRAVED EAGLE LOGO, 5 POINTED SPOKES, 9" DIA. 2067, Used Rims, 16X7, 5 LUG, 5-1/2", 96-01, DODGE, 1500, 5 SLANTED SPOKE, SPARKLE SILVER, ALLOY. 2081, Used Rims, 15X7, 6 LUG, 4-1/2", 97-00, DODGE, DAKOTA, DURANGO, SPARKLE SILVER, 5 CLOSED SPOKES, ALLOY.